Let’s get this out of the way. No, this isn’t an homage to Marlon Brando. No, I don’t have an ex-wife in Queens. Stella is a maker of coffee pots. So, why do I want Stella to take my money? Because, 50 years ago they created the perfect travel coffee pot. Then they stopped making it. I would like them to take my money, and make me a new one. Like trying to get Firefly back on TV, I know this is futile. 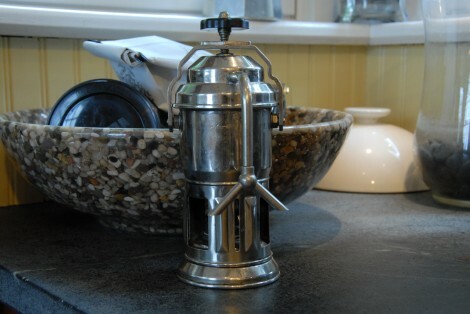 The perfect little coffee pot was the Stelle Brevettata, a moka pot design with an integral alcohol lamp. 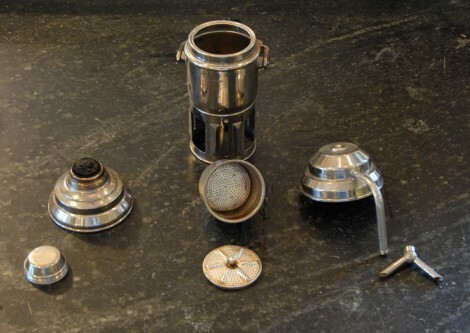 All you needed to brew coffee on the road was coffee, water, and a match. Genius. I own one, probably a very late 1940’s or early 1950’s edition. However, I don’t really use it to make coffee. It has a couple of issues. It is hard to find a gasket to fit it properly, although I’ve improvised one that seems to hold pressure. And a previous owner seems to have let it boil dry, melting some solder inside the pot. It’s probably food grade solder, not lead. Right? Maybe? I suppose I should have it tested. In all honesty, I know why these aren’t available. Alcohol is a reasonably dangerous fuel, there’s no pressure release valve (though there could be), it gets really hot, and if it got knocked over while burning it could be a real danger. I get why, even if I’m not happy about it. 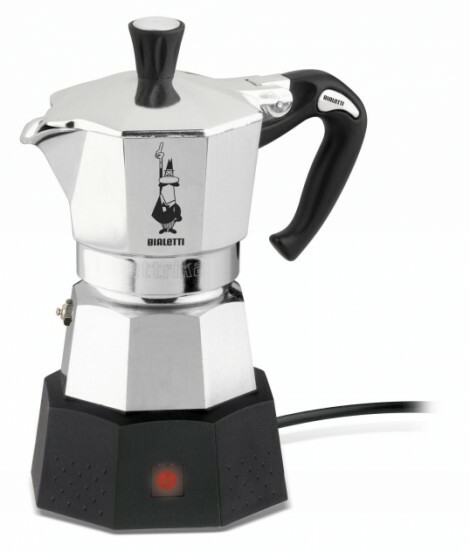 The closest I have found to a modern version of the Stella Brevettata is a Bialetti that is powered by a car’s cigarette lighter (or 12v power source, as they are now called). They are currently available, though expensive, as sort of a grey market import. 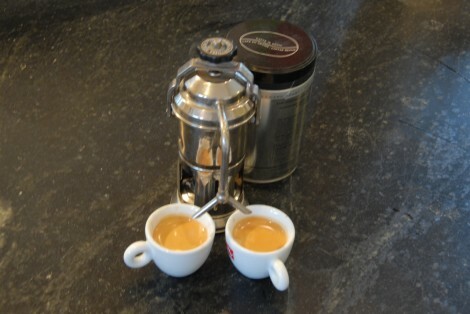 They are not imported for sale directly by Bialetti or their distributors. Why? I can only guess, but I suspect the fear of lawsuits is a factor. Somebody would set it on the center console of their car, and get surprised when the plastic warped, or knock over a moka pot of coffee on the beige floor mats of their BMW. Or, and you know this would happen, someone would try to use it while driving – reaching across and tending the moka pot on the passenger floor. And they would get away with it, until that one time they didn’t. And the poor folks from Bialetti would have to explain to a court why they put a 12v plug on something if it wasn’t supposed to be used while driving. This is why we can’t have nice things. Well, we can, but we just have to be resourceful on sourcing them…. P. S. How or where can I buy one like this one? Please. Hi Betty – I see that it has been ages since you commented. Sorry, I didn’t see it in the queue until now. I have found Stella mock pots like this on eBay (where I got this one) and ‘restored’ versions on etsy. The price range is pretty large. I think I paid $40 for mine, but I have seen them go for as much as $100. If you do decide to buy one for use, I would have it tested for lead. I think that there are home test kits available that are pretty reliable and inexpensive. Nice find! I wasn’t aware of the Esbit. I’ll take a look at getting one.